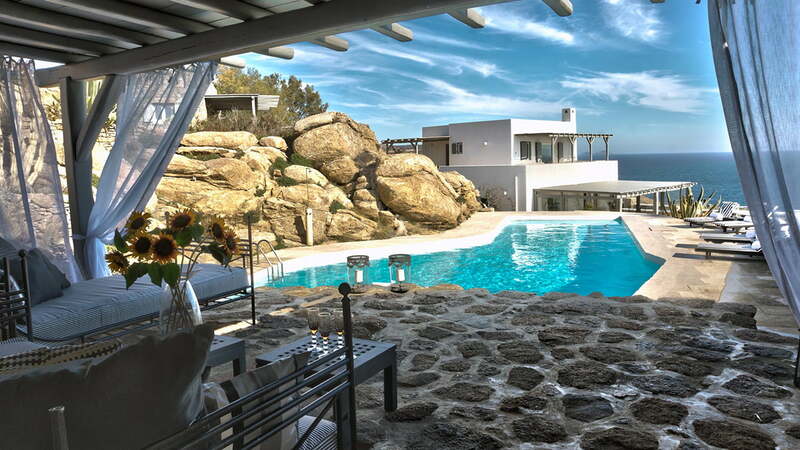 On a 10,000 square meter estate in Pirgi, Mykonos, lies a luxurious villa called Villa Carina 2. The unmatched location between Paradise Bay and Super Paradise Beach makes this resort a hot favourite with tourists who can’t get enough of the stunning 230o -view of the coast right from the villa. The famous beach restaurants Jackie ‘O and Cavo Paradiso are a short drive away. Mykonos town is easy to get to, and the pristine beaches are so close that you will never want for anything at Villa Carina 2. The luxury villa in Mykonos has a beautiful large swimming pool, and both the interiors and exteriors have been carefully designed to help guests relax. The high-end villa has cosy bedrooms, a homely living room and dining area and a lovely pergola-shaded outdoor area. Here at Villa Carina, guests can enjoy all the luxury services that we offer. As you sit on the outdoor deck enjoying the panoramic view, you can see the islands of Delos and Naxos in the distance. The azure sky, whitewashed buildings and lush greenery will fill you with a sense of peace and calm. Villa Carina 2 is part of the 10,000-square metre Paradise Estates in Pirgi. The 250-square metre property shares the estate with two other luxury rental villas and several guesthouses. Together, all the properties can house 17 couples or 34 people and two children. Larger groups can book the whole estate and can also make use of the helipad and the small church. The church is ideal for occasions like weddings or baptisms. If you do wish to organise an event on the estate, we would be happy to lend you a hand. If you are a smaller group, then just Villa Carina 2 and its two guesthouses will suffice. The main house can accommodate six couples or 12 guests, while one guesthouse has room for one couple and two kids. The third guest house has a double bedroom which is perfect for one couple. Outside the villa, the clear, fresh-water swimming pool will entice you with its serene and gentle flow. The outdoor seating area is fully equipped for a party with an outdoor dining area, lounge, bar, BBQ and surround sound. The entire deck is shaded by pergolas. The estate is located just 6 Km from Mykonos Town and Mykonos Port while the airport is just 3 Km away. The Super Paradise Beach is a short 1.5 Km from Villa Carina 2, Paradise is 2 Km, and Agrari is 3 Km. If you need any supplies, there is a shop about 3 Km from the house. - Check-in is at 4:00 pm. - Check-out is at 10:00 am. - Some villas allow events, please check with us if interested. - Please carry proof of identification with you. - Passports are required for non-residents. - All bookings are final and non-refundable. - To make a reservation, we require a down payment of 40% of the total amount when you are making the booking. - Balance 60% of the amount is required 60 days before arrival. - A security deposit of 25% of the total amount is required two weeks before check-in, done by a wire transfer or with a credit card pre-authorisation upon your arrival. - We will require a down payment of 100% of the total amount when making the reservation. - A security deposit of 25% of the total amount is required two weeks before check-in done by a wire transfer or with a credit card pre-authorisation upon your arrival. - Welcome at the airport, pick-up and drive to the villa. - We assist with check in & check out. - Welcome drinks & fresh fruits when you arrive. - Daily maid service, change of linen and towels twice a week, and the pool is cleaned and maintained. - On the first day, we pre-stock the villa with water, juice, coffee, tea, sugar, milk, and soft drinks. - Large open kitchen which is equipped with all modern appliances. - Living room with A/C and TV. - A bedroom with two single beds, A/C and en-suite bathroom with shower. The room has access to the outdoor dining area through balcony doors. - A bedroom with a double bed, A/C and en-suite bathroom with shower. This room boasts a big window and the balcony doors allow access to the outdoor area. - A bedroom with a double bed, sofa, A/C and en-suite bathroom with a shower. This room can also access the outdoor dining area through balcony doors. - The master bedroom with a big double bed, A/C and en-suite bathroom with shower and Jacuzzi. The balcony doors open onto a front terrace which is shaded by a pergola; the terrace has comfortable seating and a view of the sea. - A bedroom with a double bed, A/C and en-suite bathroom with shower. This room has a big window with an amazing sea view. - A bedroom with a double bed, A/C and en-suite bathroom with shower. The Balcony doors open onto a side terrace with pergola shading, seating and a view of the sea. - A partitioned bedroom which has a double bed on one side and two single beds on the other. There is also air conditioning, a bathroom with a shower, two armchairs, a coffee table and a mini refrigerator. - A bedroom with a double bed. - A seating area with a big window and a beautiful view of the sea.